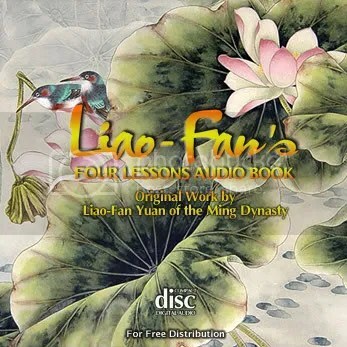 Liao Fan Yuan originally wrote Liao Fan’s Four Lessons in the sixteenth century in China. The book was intended to teach his son, Tian-Chi Yuan, how to recognize the true face of destiny, tell good from bad, correct one’s faults and practice kind deeds. It also provided living proof of the rewards and outcomes of people who practiced kind deeds and cultivated virtue and humility. Relating from his own experience at changing destiny, Mr.Yuan himself was a living embodiment of his teachings. Because their virtues accrued from kind acts are so great that these acts will alter their ‘original’ destiny for the better. The merits accrued can actually change their destiny from suffering to happiness, proverty to prosperity and short lives to long lives. Similarly, fate cannot bind those who comming great wrongdoing. When a person’s bad deeds are so great and powerful, they will cancel out the good fortune and prosperity predetermined in his original fate and his or her life can be transformed from good to bad. Whatever is sought for can be attained. The seeking is in oneself. All the fields of merit are within one’s own heart. If one seeks from within, one can be in touch with all good fortunes and disasters. The outside is merely a reflection of the inside. Therefore, if one cannot reflect within one’s own heart but instead blindly seeks fame, fortune and long life from external sources, then this seeking will be in vain. To remain healthy, one does not sleep during the daytime and stay up through the night. Wise people know that everything they achieve or fail at in life are only consequences of their own actions and thoughts. Only can ignorant person assumes that all is the work of fate and destiny! Everything in the past dissolved yesterday and all of the future begins today. The way of the Heavens is not determined and neither is one’s destiny. Destiny is not set, but is created and determined by oneself. I have come to understand that both good fortune and adversity are results of one’s own doings. These are truly the words of sages and saints! If one were to say that good fortune and adversity are all determined by the heavens, then i would consider that person to be ordinary. We should not doubt or wait to reform our faults, nor postpone our resolve to change until tommorrow or the day after. A minor fault is like a thorn sticking into our flesh and should be quickly removed. A big fault is like a finger bitten by a poisonous snake. We must cut off that finger without hestitation to prevent the poison from spreading and taking our life. There are also three methods of practice to help us reform. First is changing through action, second is changing through reasoning and third is changing from the heart. Changing through action is a hundred times harder if we force ourselves not to do something than if we just stopped doing it naturally. If we do not uproot our faults, but merely suppress them, the faults will eventually resurface even if we have temporarily stopped committing them. Therefore, the method of changing through action cannot help us get rid of our faults permanently. When we eat, we use all kinds of expensive and tasty things to nourish our bodies, enough to fill the whole dinner table! But once the meal is done, even the best delicacies will become body waste and be excreted. The result of our killing accomplishes nothing. Consuming vegetarian foods can nourish us just as well. Why let our stomach become a graveyard and reduce our good fortune through the violation of killing? To remain unmoved by slander is like letting a torch burn itself out in space. If we hear others slandering us and try to defend ourselves, it would be like the spring silkworm spinning its own cocoon. All mistakes stem from the heart; therefore we change the heart. It is like getting rid of a poisonous tree. If we want to put an end to it, we uproot it altogether so it cannot grow again. Why exert ourselves to no avail by pulling out its leaves one by one and cutting it twig by twig? The best way to reform our faults is through cultivating our hearts. If we are willing to cultivate our hearts, then it is possible to purify our faults right away. Though we may be good and virtuous in this life, we do not know what offenses we have committed in past lives. The retribution for past misdeeds still has to be undergone. Therefore, in order to change a bad life into a good life, we not only have to reform our faults, but also have to practice all forms of kindness and build upon our virtues. Always reflect within oneself rather than complain of the outside conditions. To do things with the intention of bringing benefit to others is good, to do things for the sake of oneself is bad. If what we do is for the sake of benefiting another, then it does not matter if we yell or beat that person, it is still considered good. If our intention is for self-benefit, then regardless of our appearance and respect and courtesy, it is still considered bad. When kindness springs from within the heart, it is real goodness. When we do good just for the sake of doing a good deed then it is false. In addition, when we do good without expecting anything in return, it is considered real goodness. When we practice kind deeds for some other purpose than to benefit others, it is false. Those who wish to practice true kindness need to contemplate all these differences. In performing good deeds, there is also what seems to be goodness but is actually not and what does not appear to be goodness but actually is. These are known as ‘seeming and unseeming goodness’. For example, in the Spring-Autumn Period, there was a country named Lu. Because there were other countries which took their citizen as slaves or servants, the country of Lu made a law which rewarded those who paid the ransom to regain the freedom of their fellow citizens. At that time, Confucius had a very rich student named Dz-Gong. Although Dz-Gong paid the ransom to free his people, he did not accept the reward for doign such a deed. He did it out of good intention, seeking only to help others and not for the reward money. You acted wrongly in this matter. When sages and saints undertake anything, they strive to improve the social behavior, teaching people to be good and decent. One does not do something just because one feels like it. In the country of Lu, the poor outnumber the wealthy. By refusing the reward, you lead others to think that accepting the reward money is being greedy. Thus, those who do not want to appear greedy by accepting the government’s reward will hestitate to pay ransom in the future. Only very rich people will have a chance to practice this deed. If this happen, no one will pay the ransom to free our people again. From this we can see that those who practice kind deeds must not only look at the present outcome…but also consider the act’s effect in the long run. One would do well not only to consider one’s own gain and loss…but look to see the impact made on the public. What we do right now may be good…but with the passing years, it may bring harm to others. Keeping one’s word is a virtue, but if one causes bigger trouble through keeping a small promise, then that would be considered improper. When we see people trying to show kindness, we can assist them and help their kindness to grow. When we see others who wish to do good but cannot accomplish it on their own, we can lend a hand and help them to succeed. This is the way we can cultivate ‘supporting the practice of kindness’. When those around us have shortcomings…we do not use our good points to highlight their deficiencies. When someone makes a mistake, we tolerate it and conceal it, giving him or her a chance to reform without losing their self-respect. When we let the person keep his or her dignity, this person will be even more careful of actions in the future. When we see strengths and kindness in others, praise them and make their goodness known to others. The difference between truly honorable people and ordinary people lies in their intentions. When we see people whom we feel have good potential for doing a good deed or working towards a proper goal, we can guide, support, praise and encourage them, helping them succeed in their endeavors. If another ever wrongly accuses them, we can try to clear their name and share their burden of slander. Only when we have helped them stand on their feet and be a part of good society will we have fulfilled our responsibility in helping others to succeed. By the word of mouth, one can only persuade and influence another momentarily. It is easily forgotten with the passing of time and events. No one else would have heard what we have said. If we can persuade and influence others through written works, our words can be passed on for hundreds of generations around the world. Therefore, writing to promote virtue is an act of great speech and is a most virtuous deed. It does not matter whether a favor is big or small; what counts is that it is done at a time when others need it most. According to the Buddha’s teachings, living beings are born as animals as a result of having accumulated bad karma in their previous lives. After they pay their debt in retribution, they can be born as humans again. If they are willing to cultivate they can even become Buddhas. The meat i eat today may be the flesh of a future Buddha. An animal we see today was formerly a person. It is then possible that this animal was my parent, wife, son, a relative of a friend. The humble will not wither, but shall be replenished, just as flowing water fills lower places on the ground as it passes by. Though the power to form your destiny lies in the heavens, the right to recreate it is in yourself. This entry was posted in Books Excerpted and tagged destiny, excerpt, excerpted, fate, kind deeds, Liao Fan, Liao Fan Four Lesson, Liao Fan Four Lessons, Liao Fan's Four Lesson, Liao Fan's Four Lessons, virtue, virtues. Bookmark the permalink.